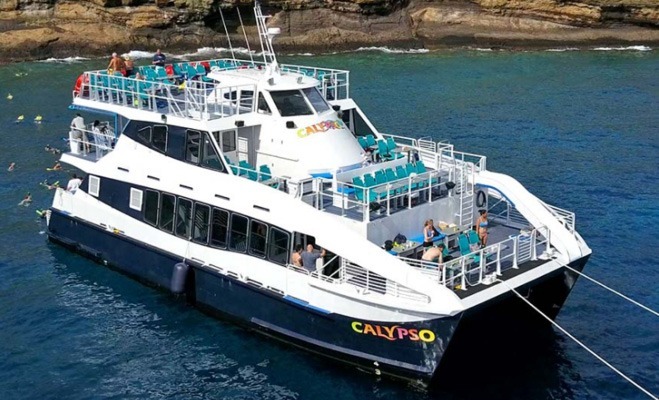 Welcome aboard the newest Maui Sunset Dinner Cruise vessel, the Calypso. 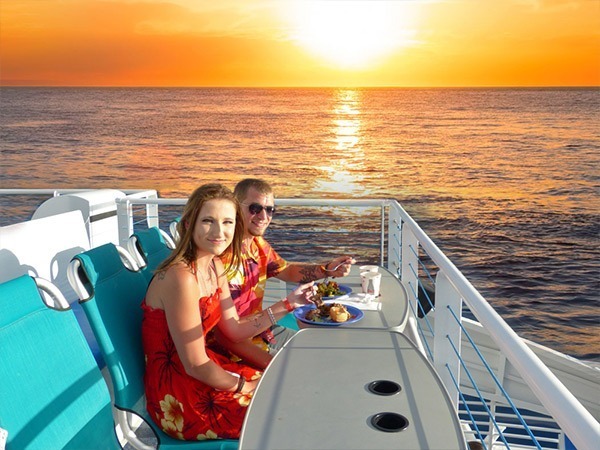 Relax and have fun on board the 65 ft. three-deck catamaran. Over 4000 square feet of table seating and three restrooms await on this large, stable vessel. You can simply kick back and take in the 360-degree sunset views. Available: Monday, Wednesday, Friday and Sunday. Meet at Maalea Harbor. May to September check in at 4:30 PM. October to April check in at 4:00 PM. Your email ticket confirmation will list exact check in time. Maalea provides plenty of parking space at a small fee. A local live musician sets the mood throughout the Calypso dinner cruise with hits from the 1940s to today. One of the crew members has a beautiful singing voice, too, and when the spirit moves her, she will pause in her duties to join in! Feel free to dance in your seat or simply listen to the music — whatever floats your boat. Tableside drink service allows you to enjoy your delicious meal, the unbeatable ocean views, and your fabulous company without interruption. Currently, all alcohol is BYOB. The Calypso dinner cruise is a lot of fun. Many folks enjoy this special excursion on their last night on the island, or to commemorate unique occasions such as birthdays, anniversaries, and engagements. Children six and younger ride and eat free (one child for each paying adult), so why not come aboard? You’ll love it! October 1st – April 30th Check-in time is 4:00 pm returning at approximately 7:00 pm. May 1st – September 30th Check-in time is 4:30 pm returning at approximately 7:30 pm. Enjoy some hors d’oeuvres while everyone gets settled in. The Calypso dinner cruise is great for couples, as well as groups of any size. Large tables for eight are in the shaded areas near the center of the boat. More intimate seating – tables for two and also for four, is ready for you and your guests along both sides of every deck. If anyone would like to work on their tans, make sure to sit at the front of the second deck, or go up onto the third; both areas are open to the gorgeous island sky. 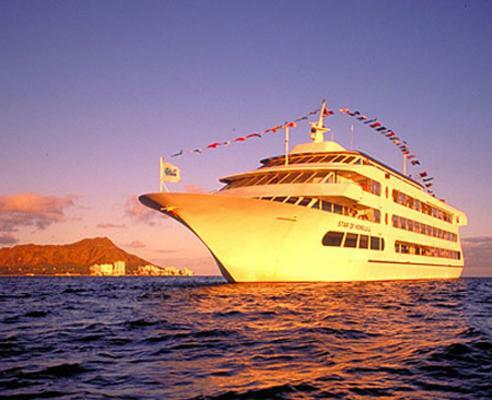 Departing from Lahaina, enjoy a memorable evening of dancing and dining aboard Maui's largest and most stable 120 foot yacht, the Maui Princess.